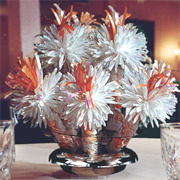 Our wedding centerpieces, filled with candy and resembling traditional wedding flowers, will have your guests talking. 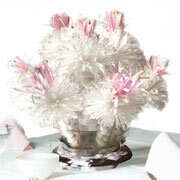 By using Florelle wedding favors as your centerpiece, you will dazzle your guests with something unique and creative, while still providing the affair with the beautiful and elegant effect of floral table centerpieces. At Florelle, we understand the significance of planning a wedding within your budget. 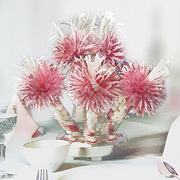 One of the most cost-effective ways to decorate your reception area is to adorn it with unique centerpieces from Florelle. At the end of your wedding day, our stunning centerpieces will become charming wedding favors for your guests to take home and enjoy. 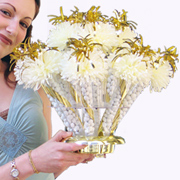 You won’t have to spend the additional time and money that comes with purchasing individual wedding favors. This innovative design is both practical and easy, allowing you to spend more time on the more important things in life—like love! 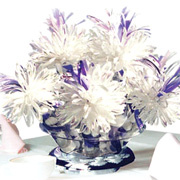 Whether you’re searching for creative wedding centerpieces or theme centerpieces, Florelle will decorate your special event with grace and style. 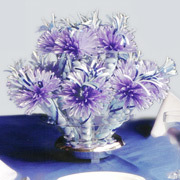 Allow our experienced designers to create the perfect centerpiece you have been dreaming of. Simply choose your desired color palette, candy fillings, and sizes, to create a customized look that you won’t find anywhere else. 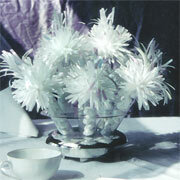 Our center pieces go well with virtually every type of style, including classic, romantic, and glamorous. From bold and dramatic settings to simple and timeless decorations, it is easy to reflect your unique personality and style with Florelle. 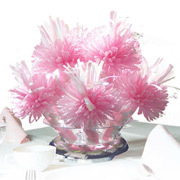 In addition to our wedding centerpieces, we also offer bridal shower centerpieces for that special celebration before your big day. 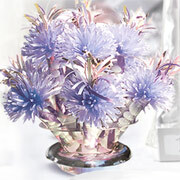 At Florelle, your favorite flowers are always in bloom! These are just some of the hundreds of possibilities!